On March 20, 2013, the House of Commons of Canada passed Bill C-279, which would add gender identity and gender expression to the prohibited grounds of discrimination in the Canadian Human Rights Act. 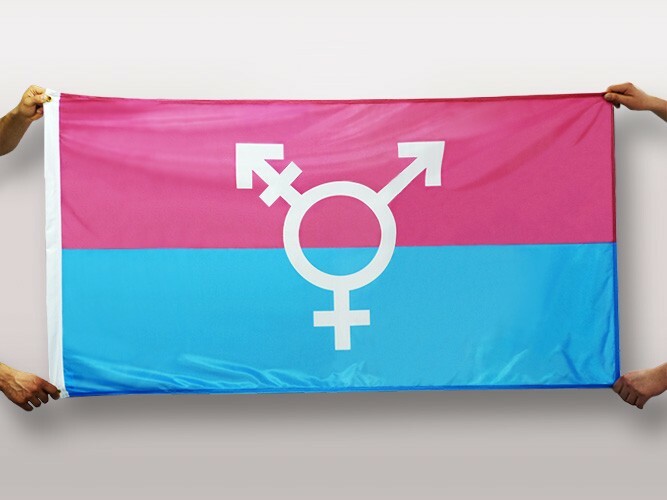 This transgender flag was first used for the Trans Day of Remembrance (TDOR) on November 20, 2010 and was unfurled by the Ottawa Police Services. In later years City Halls, Fire, Paramedic and By Law Services in Ottawa have followed suit. As word spreads, the flag is showing up in more Pride Parades and events. Designed by Ottawa Graphic Designer Michelle Lindsay and manufactured by The Flag Shop, fly this unique Canadian transgender flag to show your support and inclusion of the LGBT (lesbian, gay, bisexual, and transgender) Community. Made in Canada and only available at The Flag Shop. This flag is suitable for indoor and outdoor use. To order Canada transgender paper stick flags, please click here for order options. 4" x 6" Canada Transgender Paper Stick Flags.